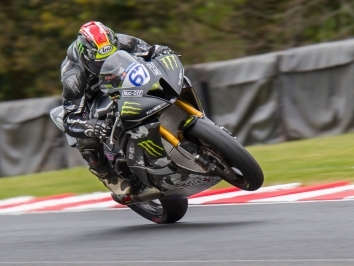 Josh Elliott and Alex Olsen split the honours in this afternoon’s two-part Pirelli National Superstock 1000 scrap as the latter bagged his first ever win in the class. OMG Racing Suzuki’s Elliott took the part one spoils before Astro-JJR’s Olsen beat him by almost three seconds in part two of the two-stage 48-lap affair. Buildbase Suzuki’s Billy McConnell got the best start from pole in race one, leading Claudio Corti, Elliott and Leon Jeacock away from the line. But Elliott grabbed the lead at Copse just as Team WD40’s Corti fell down the order, while Olsen moved up into second by the end of lap six. It was soon a two horse race of Elliott v Olsen as the latter took the lead just after the half-way mark before Elliot snatched it back two laps from the finish. 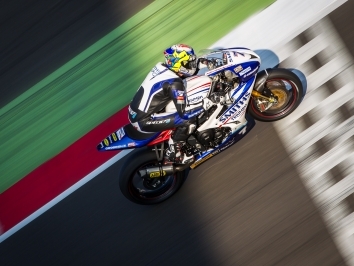 And while Tyco BMW’s championship runner-up Keith Farmer bridged the gap to the top two, he couldn’t make any more inroads and had to settle for third while Elliot held off Olsen for the win. Starting on pole for race two, Elliott was off to a flying start as he grabbed the holeshot ahead of Olsen and Corti, but it was very nearly disaster for Farmer as he stalled on the grid, avoiding a rear-end collision by less than a metre before eventually getting underway. Olsen went underneath Elliott on lap three, but the two were under little threat from the rest of the field as EHA Racing Aprilia’s Joe Collier was the next closest challenger, over 1.5s behind the leading duo. 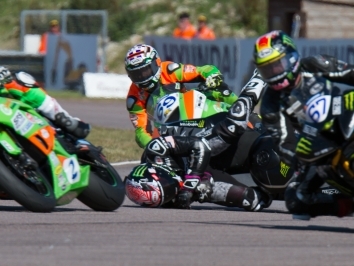 The winning battle looked to be on between Elliot and Olsen once again, but the BMW rider managed to put in a late charge and stretch a 2.777s lead at the chequered flag while Elliott had to settle for second. After a mid-race scrap for the final podium spot, McConnell lost out to Collier by 1.643s as last year’s Ducati Cup champ bagged third. McConnell’s championship lead has fallen to 3.5 points as his nearest challenger Farmer now sits tied with Collier on 197.5 to the Aussie’s 201, while Elliott moves ahead of Lee Jackson into fourth, 50 points further back.